Can you overdose on Vitamin D? It's harder than you think. Can You Overdose on Vitamin D? Yes, you CAN Overdose on Vitamin D, but the risk of too LITTLE is more than your risk of getting too much Vitamin D! Doctors seem to have a fear of recommending ANY amount Vitamin D for fear of causing Vitamin D toxicity. But while Vitamin D Toxicity IS a reality, it is such a rare phenomenon to have a Vitamin D toxicity that I have not seen one single case of it in over 10 years of being a nurse in intensive care units and emergency rooms in major cities. You should be FAR more concerned about the dangerous Drug Side Effects, which cause hundreds of thousands of hospitalizations and deaths every year, than you should be worrying about an Overdose on Vitamin D. Taking an entire bottle of aspirin or Tylenol will almost surely kill you, but taking an entire bottle of Vitamin D, in the vast majority of cases, will be more likely to actually IMPROVE your health than to damage it! However, selenium toxicity is much more common that Overdose on Vitamin D, and many children die each year from overdosing on iron, hardly anyone is concerned about these, while people always seem to worry about taking too much vitamin D, when they should be more concerned about taking too little. And while Selenium Overdose can occur in nature- an overdose on Vitamin D never occurs with naturally occurring vitamin d in Vitamin D Foods or Vitamin D From Sunlight. •	Adults who take more than 10,000 IU's per day for long periods of time. These categories comprise nearly all people who have had an Overdose on Vitamin D.
Most governments have set a 'Tolerable Upper Limit' also called a 'safe upper limit' dosage for vitamin d supplements. This is a dosage in which healthy people can take for extended periods of time with few to no vitamin d overdose symptoms. Currently, the Tolerable Upper Limit is Vitamin D 2000 IU per day. Vitamin D research shows that this 'upper limit' of Vitamin D 2000 IU per day SHOULD be the Recommended Daily Allowance for vitamin d therapy - NOT the Tolerable Upper Limit. And this dosage is certainly not anywhere near getting excess Vitamin D.
'Call to Action' letter to induce the North American governments to make the use of Vitamin D 2000 IU as the baseline minimum requirement for all healthy adults. 10 times any current recommended intakes." Other studies agree that current guidelines are not based in fact. 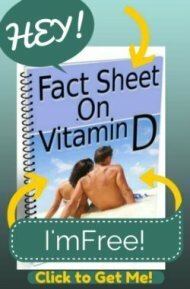 The Research Article The Pharmacology of Vitamin D, Including Fortification Strategies states that there is "no evidence of adverse effects from taking 10,000 IU of Vitamin D a day". They go on to state, "...cases of vitamin D toxicity with hypercalcemia, for which the 25(OH)D concentration and vitamin D dose are known, all involve intake of (greater than or equal to) 40,000 IU/d." That's Forty Thousand IU's per day to produce a true Overdose on Vitamin D with the required Elevated Calcium levels to go along with it! That's NOT what doctors and governments are telling us, so doctors give us inadequate amounts of Vitamin D in order to prevent a nearly fictitious possibility of overdose on Vitamin D! Another study gave pregnant women 100,000 IU's per day for the entire length of their pregnancy. The study concluded, "Thus, there is no evidence in humans that even a 100,000 IU/d dose of vitamin D for extended periods during pregnancy results in any harmful effects." In another study entitled, 'Vitamin D toxicity, policy, and science' the author states, "a prolonged intake of 250 mug (10,000 IU)/d of vitamin D(3) is likely to pose no risk of adverse effects in almost all individuals in the general population; this meets the criteria for a tolerable upper intake level." Be SURE that you understand that feeling bad after you take vitamin d is almost surely NOT an overdose, but simply Vitamin D Side Effects. They are NOT the same thing although they are VERY often confused. Please read the page on Vitamin D Side Effects if you feel bad after taking vitamin d because there are ways that you can resolve that. 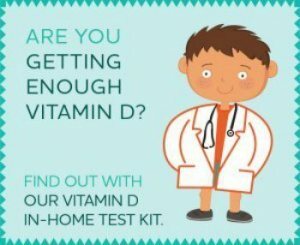 The presence of a High Vitamin D Level WITH an Elevated Calcium in the blood is really the only useful test for overdose on Vitamin D as there is a wide variation in how people tolerate upper level limits of the Vitamin D blood test. If you have high calcium levels already, that is one of the few Vitamin D Contraindications and you must NOT take vitamin d supplements unless you are specifically told to by your doctor. While high Blood Calcium Levels are useful to determine an overdose on vitamin d, it really takes an AMAZINGLY large amount to cause a Vitamin D Overdose. In fact, in East Germany between the 1940's and 1960's, children would ROUTINELY get 6 doses of 600,000 IU's of Vitamin D between birth and 18 months old. This gave these small children an incredible 3,600,000 IU's of Vitamin D in 18 months. That is Three Million, Six Hundred Thousand IU's in 18 months in small children as a routine hospital procedure for several decades!! 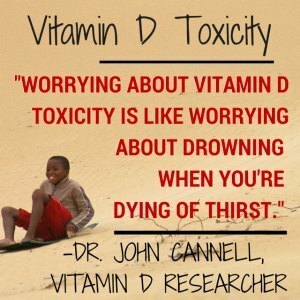 A study called Intermittent High Dose Vitamin D During Infanc yquestioning this practice's safety noted that, while many of the children developed transient high levels of blood calcium levels, "...all the infants appeared healthy and repeated inquiries... have failed to identify clinical vitamin d toxicity as a result of the prophylactic program...". Also, it is a common practice for doctors around the world to use a therapy for rickets in infants and children a Vitamin D Therapy called'Stosstherapy' which gives these children with rickets a one-timeVitamin D Injection of 600,000 IU's. Again, Vitamin D toxicity and Vitamin D overdose symptoms are extremely rare- so in the vast majority of cases, if you are takingVitamin D Supplements, even accidentally taking a full bottle all at once will not cause an Overdose on Vitamin D. However, since a Vitamin D Overdose CAN occur, always stick with recommended dosages and Get your Vitamin D Level Checked in order to get your levels up to the 'optimal' Vitamin D Level as recommended by the latest research on vitamin d toxicity and vitamin d therapy. There have been zero reported incidences of Vitamin D Toxicity from too much sunshine. The body seems to have a feedback mechanism that prevents too much Vitamin D from being made through the skin even though one exposure can give you the equivalent of up to 20,000 IU's for one single whole body exposure! We were designed to get our Vitamin D from the sun. But other concerns about getting excessive sun should concern you enough to keep exposure to the sun at moderate levels. 5000 IU Vitamin D 3 Supplements- Vitamin D3 is really theONLY vitamin d that you should be taking. Get Vitamin D 3 in a clinically relevant dose for adultsSunshine Mist Vitamin D Spray- This Vitamin D3 is GREAT for kids. Just a spray a day is all it takes.The Vitamin D Solution: A 3-Step Strategy to Cure Our Most Common Health Problem - Take a look at this EYE OPENING book. This fascinating account of the health benefits of Vitamin D will keep you turning pages far into the night! What is the correct number you should get from a blood test for Vit D. Mine was 98. I was told it was toxic? How do I get rid of Vitamin D overdose? Is 50 000 IU's a Day of Vitamin D Going to Make Me Overdose? Am I in danger of overdose problems of vitamin D? Is It Possible that We are Overdosing on Vitamin D?